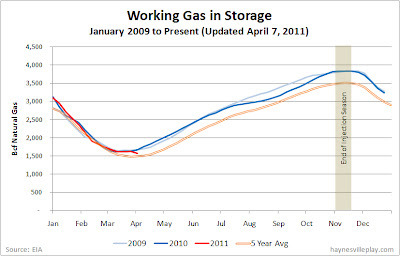 The weekly EIA working gas in storage report showed a 45 Bcf decrease after last week's cold weather, bringing the storage level down to 1.579 Tcf. The weekly withdrawal was in great contrast to last year's 29 Bcf injection and the five year average's 13 Bcf injection. This is likely the last withdrawal until the cold weather comes in late fall. 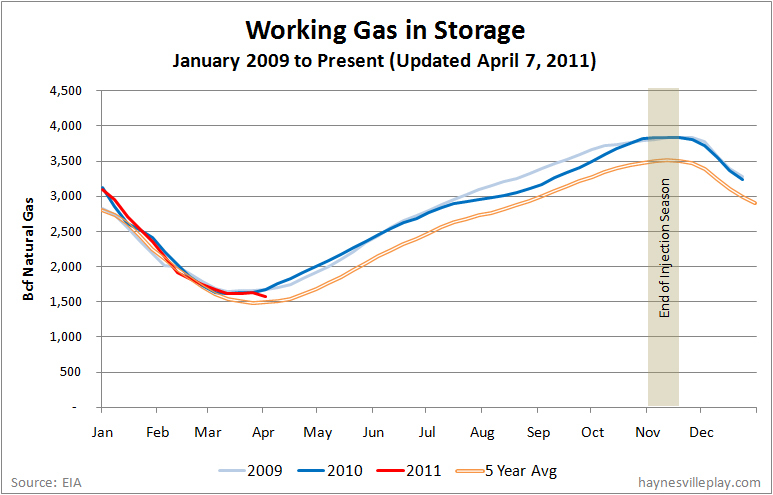 The current storage level is 86 Bcf (-5.2%) below last year's level and only 10 Bcf (+0.6%) above the five year average. Temperatures last week averaged 42.1 degrees, which was 7.0 degrees cooler than last week, 6.6 degrees cooler than the same week last year and 5.9 degrees cooler than normal.